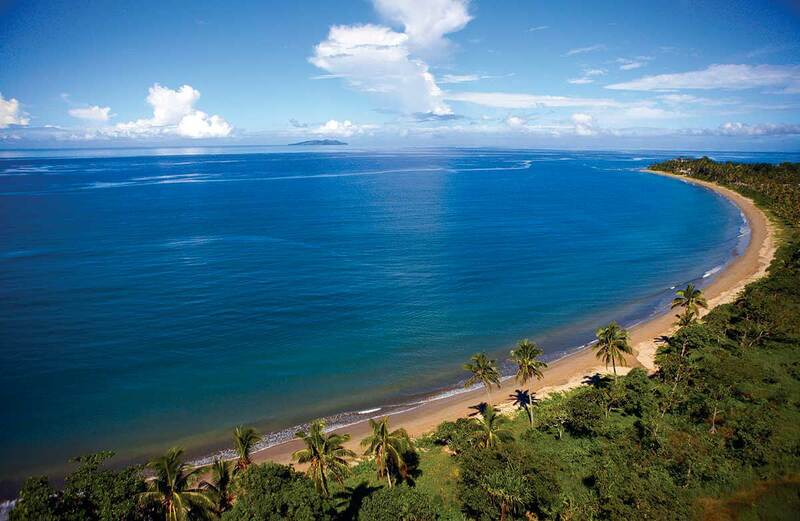 Set along the south coast of Viti Levu, Nanuku is acclaimed for its gorgeous beach, blend of contemporary luxury and traditional culture, and resort’s highly personalised service. 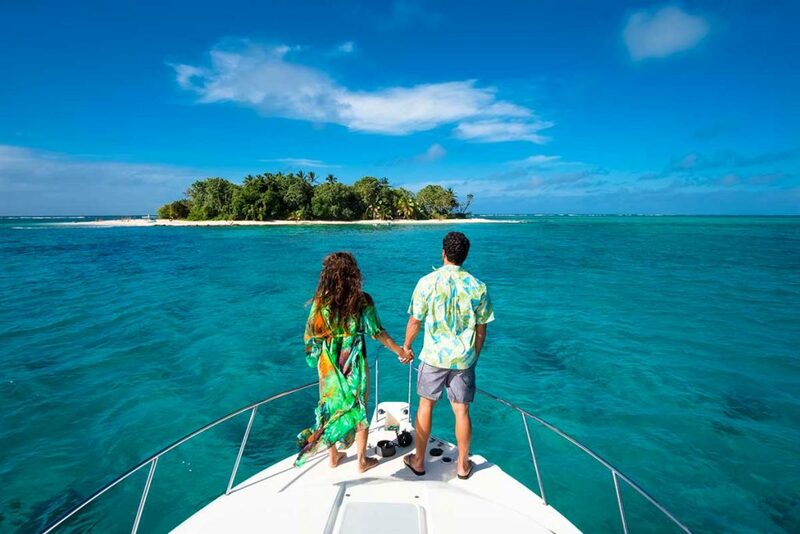 Located near Pacific Harbour, Fiji’s adventure capital, Nanuku fittingly offers an array of bespoke outdoor activities to its homeowners and resort guests. 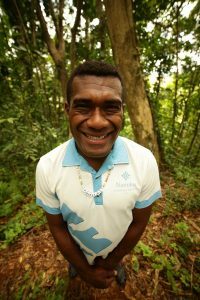 Nanuku Auberge Resort staff includes matais (“experts”) and i tokanis (“best friends”) to guide and accompany you on your adventures, so you have the knowledge and confidence to try new things and learn the authentic “Fijian way”. Children get in on the fun too. Nanuku Auberge Resort offers an Adventure Club for young guests with ziplines, a climbing wall, creative workshops, and many other activities. Children can do these with a parent or their meimei (a nanny provided by the resort for any child under the age of six). With your i tokani, make selections at colorful open-air markets along the Navua River, then visit an organic farm to pick remaining ingredients. Back at the resort, staff in warrior attire use these to demonstrate traditional cooking techniques. Resulting signature dishes like kokoda (fish ceviche) and bamboo prawns are a feast for the eyes as much as the body. Other foodie favorites include mangrove crab grabs and moonlight river prawn hunts. Visit beautiful Nakorovou Village and learn about their way of life. Trek inland as your guide shares stories of the flora and fauna. Cool off in a waterfall and partake in a kava ceremony. This trip includes a sulu for you to wear. You’ll fit right in! 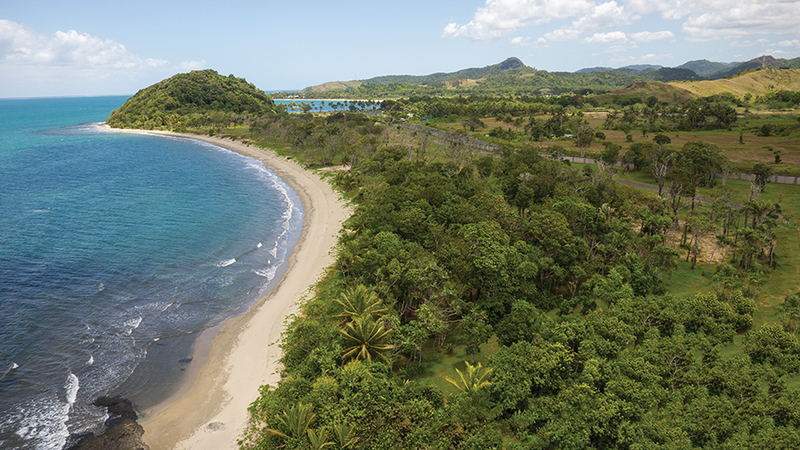 Hike up the sacrificial hill of Fiji’s ancestral gods, located right on Nanuku’s grounds. Observe the many species of native trees planted by village chiefs from all the different provinces of Fiji as gifts to the gods. Every native tree from each province is growing on this sacred mount. Plus the view at the top is spectacular. Nanuku sits on Beqa Lagoon, with a myriad of soft coral ablaze in every colour imaginable. 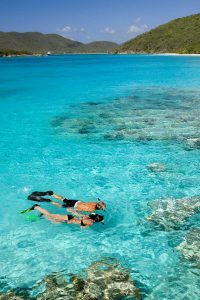 Or jet ski out to famous Kombi Reef to explore some of the world’s finest, and relatively undiscovered, underwater worlds where hard coral ledges drop off along walls into the blue abyss. Never snorkelled? No worries. Nanuku staff provide instruction in the clubhouse’s infinity pool to put you at ease. Experienced snorkellers can add sea wings or a DPV to explore the reef faster. And don’t miss your chance to join in an educational and fulfilling coral planting session with Nanuku’s resident marine scientist. Sometimes you have the need for speed. Get your adrenaline pumping as you navigate Nanuku’s three wide coves and around the vast Beqa Lagoon. 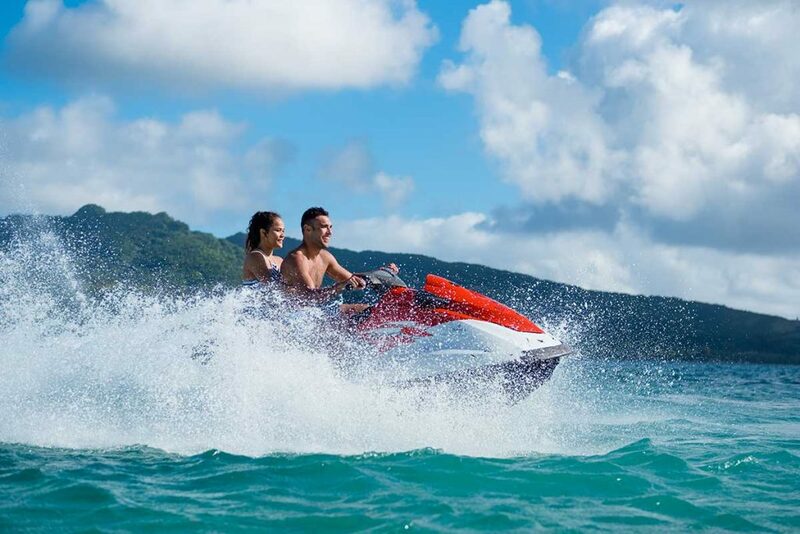 Jet ski packages through Nanuku Auberge Resort can incorporate jumping into the water at key snorkel spots or cruising out to Nanuku’s private island for a picnic and some secluded fun in the sun. There’s a river experience appropriate for everyone here. Whitewater raft deep into the highlands of Namosi, traversing grade 2-3 rapids. Or slow the pace a bit, paddling an inflatable kayak through the gentle waters of the Middle Navua River. Pass by emerald rainforests with exotic birds, soaring cliffs, and majestic waterfalls. 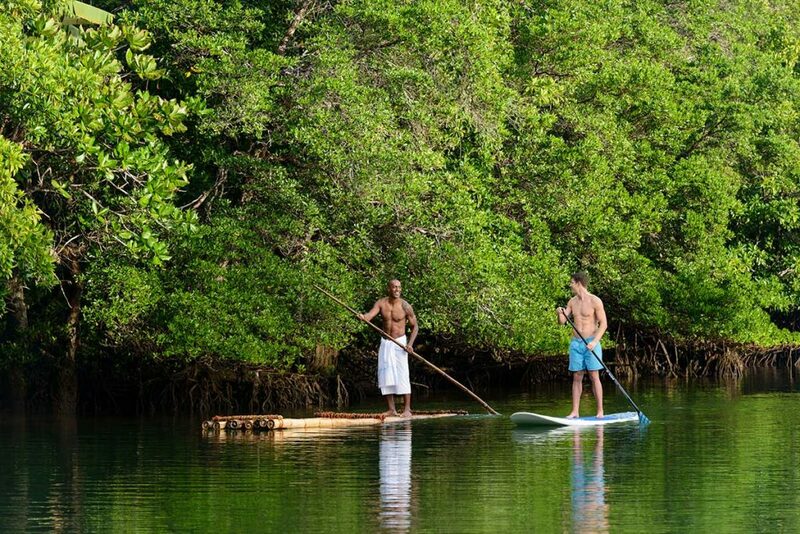 Or simply grab your designated i tokani (“best friend”) and have them take you out to explore Nanuku Auberge Resort’s Taunovo Creek, via a traditional bilibili (that maybe you make yourself) or paddleboard. Shark diving is an experience not to be missed, but certainly not for the faint of heart. Divers, with the assistance of professional divemasters, have the opportunity to see bull, black tip reef, grey reef, and female tiger sharks. But remember, they can see you too! Stay safe down there. Meet local hunters, and their well trained dogs, for an early morning start. Along the way, in search of wild boar, experience what sustenance the jungle provides to keep you going. Hunters explain inherited and indigenous hunting techniques, and you may witness an actual chase where no modern weapons are used. This escapade requires fitness, endurance, and curiosity. Are you brave enough? Feeling lucky? Ready to do battle with the big boys? 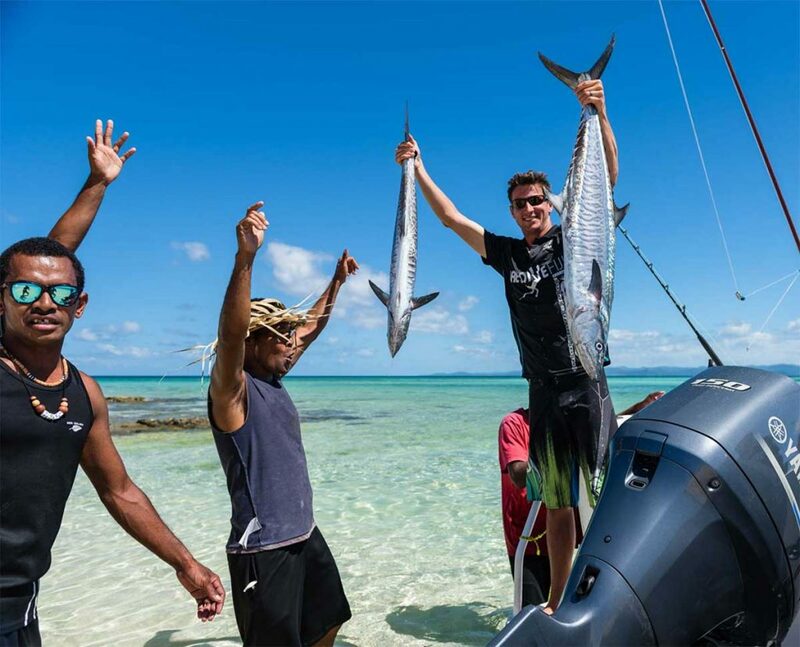 Join the Nanuku crew on a deep sea fishing expedition with Shimano fishing gear, lures, and refreshments. Chase down Spanish mackerel, tuna, mahi mahi, sailfish, maybe even a marlin. Bring your prized catch back to Nanuku Auberge Resort and the chef will prepare it for your family for dinner! Probably the most challenging thing to do at Nanuku is… leave at the end of your stay. You’ve made many friends here and feel like a local now with the insider knowledge you’ve gained about the culture and traditions. It’s okay, you’ll be back. Maybe even purchase a villa here and return often to the welcoming arms of your Fijian brothers and sisters. Learn more about everything there is to do at Nanuku on their website, NanukuFiji.com.